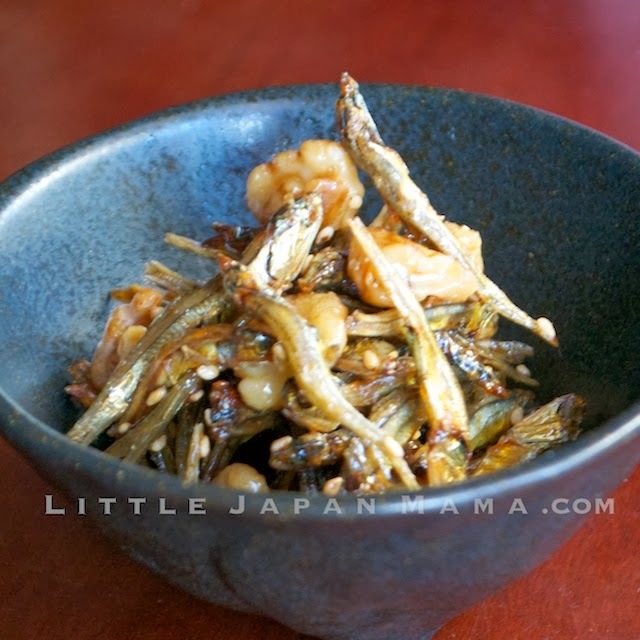 Tazukuri is quick and super easy to prepare, and keeps well in the refrigerator for weeks. (Not that it ever lasts that long in our home!) 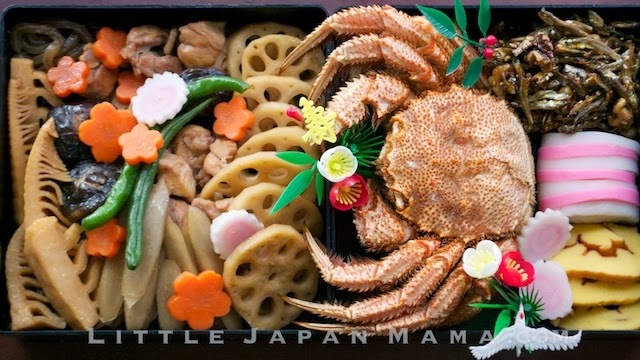 It's one of the Osechi Ryori New Year side dishes, but it also makes a tasty and healthy snack that can be enjoyed anytime, on it's own or as a side dish in a meal with rice. The name "tazukuri" means "making rice fields". 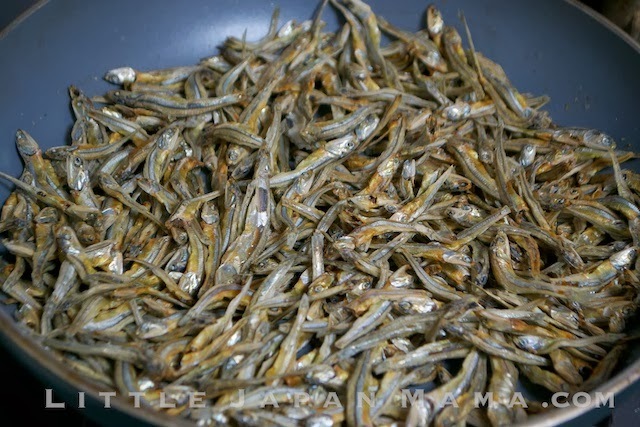 Anciently, these tiny dried fish were used as fertilizer in rice fields and helped to bring in an "abundant harvest". This has become the symbolic reason they are part of the New Year celebration. 1. 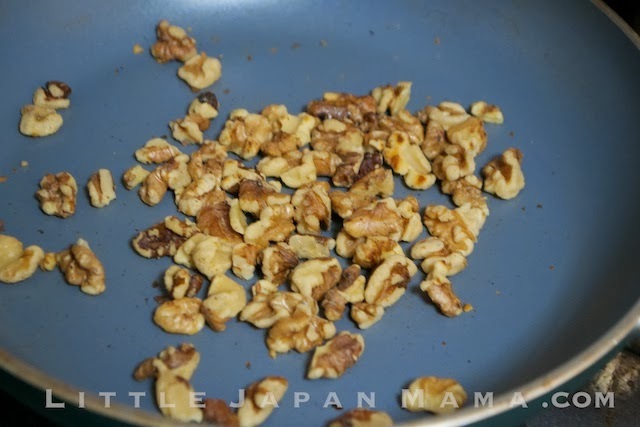 Toast walnuts by placing them in a frypan and gently heat, stirring, until fragrant. Tip onto a plate. 2. 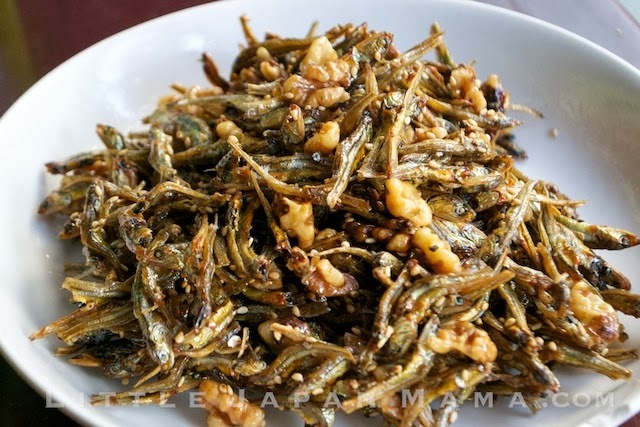 Wipe frypan clean, then toast dried fish in a similar manner until crispy. Tip onto a plate. 3. Wipe frypan again, then place sugar, mirin, sake and shoyu in frypan over low heat and swirl to dissolve sugar. Gently bring to the boil, simmer 1 min, then remove from heat. 4. Add fish, walnuts and sesame seeds to the frypan, toss to coat well.